The Royal Oak Concept GMT Tourbillon features a second time zone at three o'clock - a state of the art mechanical caliber with a titanium case and fascinating openworked dial. An innovative "H-N-R" indicator is placed at six o' clock; "H" means that the crown is set in the Hour setting position, "R" means that that if you turn the crown, you will rewind the watch, while "N" means that the crown has been set in the normal position and that the watch is running normally. 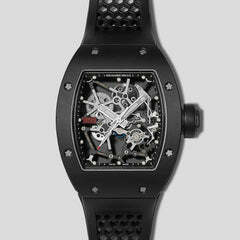 The watch features a remarkable 237 hour power reserve -- an approximate nine days. Hand wound watch with GMT function and tourbillon. 44 MM titanium case with black ceramic bezel, second time-zone indicator at 3 o’clock, crown position indicator at 6 o’clock, tourbillon at 9 o’clock with blackened bridge, black ceramic central bridge, white gold Royal Oak hands, black anodized aluminium inner bezel, black rubber strap. Water resistant to 100 meters. This timepiece from 2018 comes complete with box and papers from Audemars Piguet and is in mint unworn condition. The majority of time remains on the factory warranty. 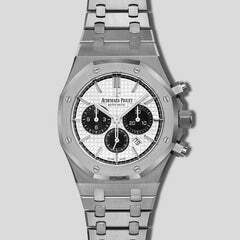 Warranty: Majority of time remains on the AP warranty.